Brands Nokia Will Nokia Comeback in 2016 ? 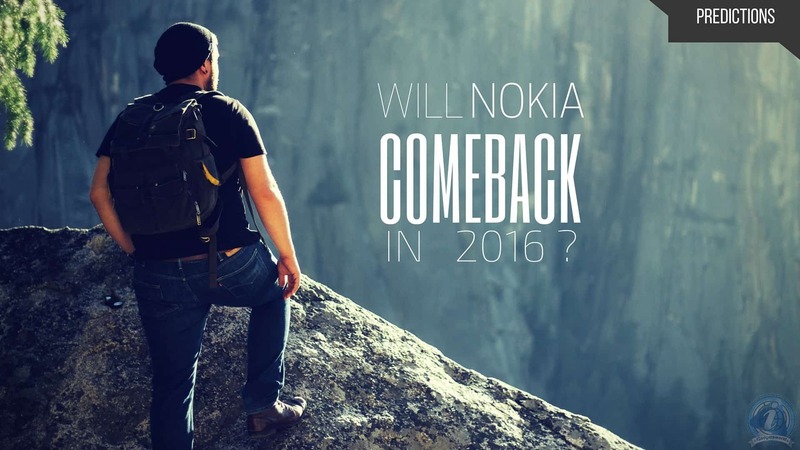 Our top 5 predictions if Nokia comeback in 2016. Most of the techies had already rumored that Nokia will surely make a comeback & launch new devices in 2016, but still there is no proper confirmation if Nokia comeback or not. Well, back in November 2014, there was a news saying, the Finnish company will shut down its plants in India as Microsoft acquired all its assets. This made everyone believe that Nokia comeback won’t be possible as they will concentrate more on other operations, which is found to be true. Nokia had recently launched OZO camera & already started working on 5G. Well, last year there were many leaks on Nokia’s Android phone (codenamed: C1) and is indicated to launch in 2016. Besides the android phone, Nokia had already launched an android tablet N1 which could have become a path-breaker in tablets, but the lack of marketing & word of mouth, the device didn’t become popular. Though the overall tablet sales are getting low year by year, it is not new to see the low sales for N1 tablet. Anyhow let me talk about Nokia comeback related stuff & what should we expect if the firm returns to smartphone segment. What to expect if Nokia Comeback in 2016? This is what a Nokia can! Nokia is known for its build quality which made every other competitor copy it, but none of the mobile manufacturers made any outstanding phones like Nokia. There are many reasons which made the Finnish company went down in the sales, but it was always remembered as one of the finest brands when it comes to phones segment. I still remember my old days using Nokia X6-00 which is the first capacitive touch smartphone from Nokia preceding the old Nokia 5800 Xpress Music & I still love the phone. This is what a Nokia can! Making us remember even when it is not manufacturing any mobile (just saying). So, if Nokia comeback into the phone segment again, it may not quickly take over the market share or can become a top rival to the existing top brands like Samsung, Apple, Xiaomi etc. But, we can consider the return as a re-birth to Nokia. As of now, all the Lumia phones are manufactured in the name of Microsoft & they are purely windows based. Just that users are more into Android & iOS thing, I still doubt if Microsoft can reach good sales figure with the Windows 10 mobiles. So, with that perspective, it is hard for Nokia to give a perfect competition, but with the time, it can easily achieve it. If you go back in time like 3 years back, Nokia was supposed to start Android, but it shifted to Windows & released several Lumia devices which have amazing build quality & the best battery backup, but the rise of Android (CoughGalaxycough) eventually made phones smarter & cheap which are quickly cashed by Samsung. This became the first downfall for Nokia. So, after returning to the phone segment again, Nokia would target the audience by overcoming the problems faced by a typical Samsung user. Well, we have listed down 5 typical challenges faced by a Samsung user which clearly depicts that the company’s target is sales & nothing else. The recent leaks denote Nokia is coming with alphabet series again, & this time, the phone’s code name is leaked to be A1. Earlier we have seen Nokia phone models in ‘E’ series, ‘X’ series & ‘C’ series, and I feel the ‘A’ series would be a complete re-boot revealing what Nokia can with Android OS. The sales or market share may not become stable initially, but if the company comes up with the same build quality mobiles like it used to make earlier then it can reach the masses by word of mouth which is very easy for this classic brand. Well, we can consider this is an initial step towards a stable position in the top brands. Well, to be honest, I am going based on my intuition. Nokia was popular earlier for many reasons & it was releasing phones based on demographics. Comparing this to the current scenario, it is very hard to find a mobile which satisfies all the user base. So, as Nokia had already proved what it can, we can expect the same thing now. Will our dream come True? I hope so, who doesn’t want to see our beloved ‘Nokia’ in the mobile segment again, good old days should come back. It’s not the rise of Android or the downfall of Symbian which killed the brand, it is just that Nokia believed in something which they want to show, but have partially failed. It may not happen this time & I wish Nokia returns to phone segment & should take care of this so-called top brands.